Home » Financial Planning » Home Loans » Income Tax » Property » Save Money » Should You Repay Home Loan or Invest? Should You Repay Home Loan or Invest? Should you put extra money towards your mortgage or invest? Is it a good idea to pay off your mortgage ever? There's a double whammy hitting the home-owning borrowers. Money in the bank earns pitiful rates, while mortgage costs haven't tumbled nearly as much. ARE YOUR SAVINGS RATES HIGHER? This isn't a question of whether repaying your mortgage beats your current savings.Instead, it must be 'does repaying my mortgage beat the highest paying savings available? '.Many people are earning pitiful rates, and assume they can't improve them. Yet much better deals are often available. So if you haven't already, You needn't switch to them right now, as overpaying your mortgage may win out. But at least know what's on offer, and compare against that to calculate the right option. WOULD YOU FACE PREPAYMENT PENALTIES? Some lenders punish those who try to repay their mortgage quicker than agreed. 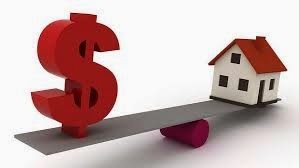 This is especially common if you have a special offer fixed or discount rate deal .This is because lenders want you to stick with them once the cheap rate ends, as at that point their rates shoot up. This means it's not in their interest to let you repay the mortgage more quickly, because the longer it takes you to repay, the more they earn. Thankfully many allow annual prepayments without penalties. But you must check with your lender, as any substantive extra costs are likely to outweigh the gains from overpaying the mortgage. DO YOU HAVE OTHER DEBTS, SUCH AS CREDIT CARDS OR LOANS? A crucial rule of debt repayments is: clear the most expensive debts first. Do so and the interest doesn't build up as quickly, saving you cash and giving you more chance of clearing debts earlier. Therefore, as a rule of thumb...Clear credit cards and loans before overpaying your mortgage, as they're usually more expensive.Yet as with any rule of thumb, there are exceptions. Good old-fashioned budgeting logic says it's always worthwhile having a cash emergency fund. While for people with expensive card and loan debts we generally disagree, for those who are debt-free, apart from a mortgage, this is a good idea. Prepay most mortgages and the cash is gone. So if the roof leaks or boiler bursts you may be forced to use expensive credit cards instead. Your earlier prepayments won't stop lenders charging you for being in arrears if you miss monthly repayments. So it's always a good idea to keep an emergency fund in savings - three to six months' worth of cash is a good guide, enough to live on if you lost your job or had other issues. If you're thinking of using newly arriving extra income (such as a pay rise) to overpay your mortgage, then build up an emergency fund first. As a minimum...Put enough aside to cover mortgage repayments for at least six months. It's worth checking to see if your mortgage is over-expensive before making the decision. If you can get a cheaper mortgage, it may change the result. Dynamics of the repayment of Home Loan/mortgage will be clear if we first calculate the after-tax mortgage interest rate. For example, if your interest rate for your mortgage is 10% and you are in the 30% marginal tax bracket, your after-tax mortgage rate is actually 7%. Why? Because under current law, if you pay mortgage interest, it’s deductible. You get a tax break for the interest you pay on your mortgage. So if you pay 10% to the bank but get back 3% from taxman, your net cost is only 7%. Now calculate what your after-tax return is on alternative investments. For example, if you estimate that you can earn 9% with your investments but you’ll pay 30% in tax, you’ll really only net about 6.30%. If your after-tax return is higher for alternative investments, keep a high mortgage and invest as much as you can. But if your after-tax mortgage rate is higher than your after-tax investment return, pay off the mortgage before you invest a dime.